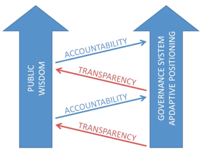 Accountability and transparency are two crucial aspects of government oversight that ensure ethical engagements. Both of these characteristics are included in the top core values that describe the personality of a person or an organization. Accountability and transparency practices have been put in place in most government agencies and are expected to be upheld, but there remains a shadowed area where these implications fail to be maintained. For example, consider the recent issues with the Veteran’s Affairs hospitals and their failure to adequately care for their patients. Accountability is the aspect of administrative responsibility through which officials are held answerable for general notions of democracy and morality as well as for specific legal mandates. Elected and appointed officials are working directly for the public. Their wages and benefits are paid by tax dollars. As such, they are required to meet expectations and remain accountable for the work that they are being paid to perform. Elected officials are held accountable by elections. They are rarely removed before an elected term of two, four, or six years. The elected officials receive constituent requests which are classified as casework to keep the constituents happy. However, there are no mandated methods for casework to be handled or requirements for it to be reviewed by the official, so many officials fail to respond personally or review their casework. Casework is often controlled by an office secretary with a stamped or typed signature. At one time a primary method of accountability for elected officials was media presence. With the extreme loss of trust in the press, there have been changes to how failures in the government are being addressed. Appointed and administrative officials are often less accountable than elected officials. Their legislative oversight by Congress is based on the size of the federal government. 535 members of Congress oversee agencies through legislative oversight. There are currently 445 Agencies listed in the Federal Register. That provides approximately 1.2 congressional members per agency. Executive officers are expected to take responsibility for those under them, but often the executive officers are underfunded and overworked, so they do not have the time to oversee the daily duties of the employees. This example does not take into consideration that most political corruption is happening at the height of the organization. Recent politics have illustrated that our current and past administrations not only house the failures of those in their circle, but hide those failures to the public. The public remains wholly misinformed or uninformed of public policy, thus causing their ability to make decisions in the best interest of the country to fail. Part of the difficulty in holding members of government offices accountable is the unionized workforce and lack of at-will employment. Getting rid of an ineffective employee in the private sector can take over a year and requires extreme amounts of documentation and paperwork. The elongated process is often the case due to a large number of unemployment claims and suits for discrimination in the workplace. Removing an employee from a governmental setting is even more difficult. Transparency means that citizens have an inherent right to know the truth about public issues and the government ensures that this right is met. Administrators and politicians have more methods of secrecy, and more secret content, than any other profession. Public discussions are littered with false opinions and data to divert the public from knowing certain truths. Finding information on regulations, legislative sessions, etc. is only accessible if you are skilled in law or government. With that being said, public administrators are expected to be forthcoming with all information related to their agency. The purpose of public administration is to serve the public. If the public is not provided with the data obtained by that agency, then the service relationship will be damaged. Also, there are often no publicized or easily accessible methods for reporting issues with accountability and transparency within an agency. It is commonly agreed that implementing a group of people whose sole purpose is to seek out failures within an organization can inhibit productivity, but providing a way of reporting which is independent of the agency itself will assist in highlighting possible unethical activity within the organization. Legislative agencies often run without proper oversight and fail to report data which is essential for the public to know to ascertain the climate of the country. Federal information is much easier to reach than local and state, some of which don’t have a publicly accessible format. However, the federally available methods cause extreme hardship on the average person.